I have already published a post on numbers. However, there I expected that you know the basics and that you need to learn a bit more about them. This post is different. Here, I would like to start at the very beginning and present the basic numbers from 0 to 99. To achieve this there is a mind map, two quizzes and several worksheets dealing with these. I hope that you will find the article interesting and useful. In the following mind map I try to depict all the way in which we form the numbers from 0 to 99. Be careful not to leave out the hyphen. If you write the number without it, then the number is wrong!!! 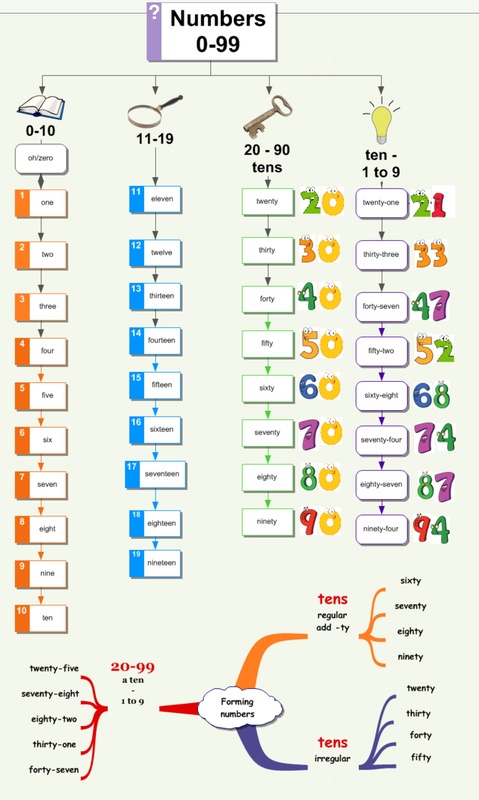 In this section I would like to share several worksheets to practise the numbers in a fun way. The first one is a worksheet with two colourful crosswords. Print out the pdf file and solve the puzzles. The second worksheet contains four different tasks. There is a crossword, a spiral crossword, a wordsearch and a hidden words task. Once again, the file is in pdf, so you have to print it out to be able to solve it. You can find more interesting worksheet at Alenka’s site. The third worksheet is for teachers. It contains a bingo game. Print out as many cards as necessary and then call out the numbers and decide who wins. I play a slight variation by asking the students to read one of their numbers. If you are a teacher you might like to have a dictation file. This part contains two quizzes and games to practise the numbers. In the first quiz you have to write the numbers in words. If you pass the quiz you will have a chance to play a game to practise your vocabulary. Good luck!!! The second quiz is a listening quiz. You have to listen and choose or write the numbers you hear. Especially the last part is really difficult. If you pass, you can play the game calle Math pop. Good luck!!! Excellent material for my English class, thank you. Perfect ,original and helpful for English teachers and students , thank you.